This is a question I've jokingly put forth to fans of J.R.R. Tolkien's The Lord of the Rings trilogy over the years, endlessly amused by the (often angry) responses it generates. "The eagles' primitive brains would be overwhelmed by the evil power!" they would answer. "The poisonous gasses from the volcano would kill them if they tried," or "They were neutral in the battle and wouldn't commit to aiding any one side," the fans would offer, attempting to explain away what to many seems like a massive plot hole. The truth is Tolkien doesn't need his fans to rise to his defense; I know the answer to the question. If The Lord of the Rings were the simple tale of an evil ring and a volcano, then yes, having a bird arrange a hasty meeting between the two would make sense. This is not the story about the One Ring and Mount Doom; it's the story of a group of heroes, the bonds they form, and the sacrifices they make in order to do what's right. Without Frodo's brave sacrifice, Samwise's unwavering loyalty, Boromir's desperate struggle, Aragorn's steadfast courage – without this group of men, dwarves, elves, and hobbits demonstrating their inspiring humanity at every turn, The Lord of the Rings would be nothing more than a well-crafted, scenic but soulless journey from point A to point Doom. And that sums up The Lord of the Rings: War in the North quite nicely. A human, an elf, and a dwarf walk into a bar. They have names, of course, but after ten hours of gameplay I'm hard-pressed to remember them. I could look them up, but they'd mean even less to you than they do to me, so what's the point? The bar does have a name, however: The Prancing Pony, located in the heart of the village of Bree. It's the tavern where Frodo and friends first meet Strider, AKA Aragorn. It was this famous location and my meeting with such a prominent figure from the fiction that gave me hope that War in the North would be more than a generic hack-and-slash role-playing game based in Middle-Earth. My party of three was tasked with delaying a gathering army to the north, giving the ranger and his hobbit friends time to escape the clutches of the Black Riders. For a brief, shining moment, I was an active part of the main story. The feeling didn't last. Soon I was off on a mission to take down an evil menace never directly mentioned in The Lord of the Rings proper, a generic villain perfectly suited to my generic heroes. Though well designed and rendered, the familiar locations I passed through might as well have scenic postcards from distant friends, informing me how much they wished I was with them on a mission with more meaning. Perhaps the greatest feeling of detachment from the core story came midway through the game, when elf, dwarf, and ranger briefly stops by Rivendell, legendary home of the elves where the Fellowship is first formed. Here I encountered familiar faces like Gimli, Aragorn (again), and Legolas. While chatting with them about the epic journey they were about to undertake, the question that inevitably came up in the game's consequence-free dialogue system was, essentially, "Can we go with you?" The answer, as expected, was uniformly negative. They tried to tell my party that their northern tasks were just as important as taking the One Ring to Mordor, but that feeling never sank in. By the end of the game I had completed a task that, for all intents and purposes, would probably have resolved itself once the ring was destroyed anyway. I said in my Gut Check of The Lord of the Rings: War in the North that I had developed an idea of what I wanted Snowblind Studios Middle-Earth based role-playing game to be, and the developer had delivered. That's not something that's changed since finishing the game. Should You Buy The Lord of the Rings: War in the North? Yes. The characters look good for cardboard cutouts, their wardrobe morphing as more powerful equipment is found. The combat is solid and meaty. Enemies are as varied as one would expect in a Lord of the Rings game (orcs, goblins, bigger orcs, spiders), with a bit of an overreliance on the troll as a mid-boss encounter. It's a bit on the easy side, but hopping into a readily available multiplayer match where you have to rely on human nature instead of artificially intelligent teammates presents more of a challenge. There are quests, side quests, limited crafting opportunities, and secrets galore. Has the lack of immersion or investment in the story hurt my desire to play? Somewhat, but not entirely. The part of me that craves more powerful equipment and more points added to each characters simple skill trees gladly spent eight hours going through the main campaign, and now I'm two hours into my second play through on the new difficulty level unlocked after defeating the first. The enemies are tougher and more numerous, but the items rewards more than make up for that. If only there were a way to automatically skip the useless cut scenes, I'd be in OCD hack-and-slash heaven. Still, there's always a tiny voice in the back of my head constantly wondering when my three heroes are going to truly matter to Middle-Earth. The Lord of the Rings: War in the North is an incredibly playable hack-and-slash role-playing game. Snowblind Studios have once again demonstrated their mastery of the technical aspects of creating this sort of game, established in the past in titles like Baldur's Gate: Dark Alliance and Champions of Norrath. I'd go as far as saying this is exactly the game I imagined when I first heard the studio was working on the title. Of course back then I had no background information on the game's story or characters. As it turns out, neither of those really mattered. 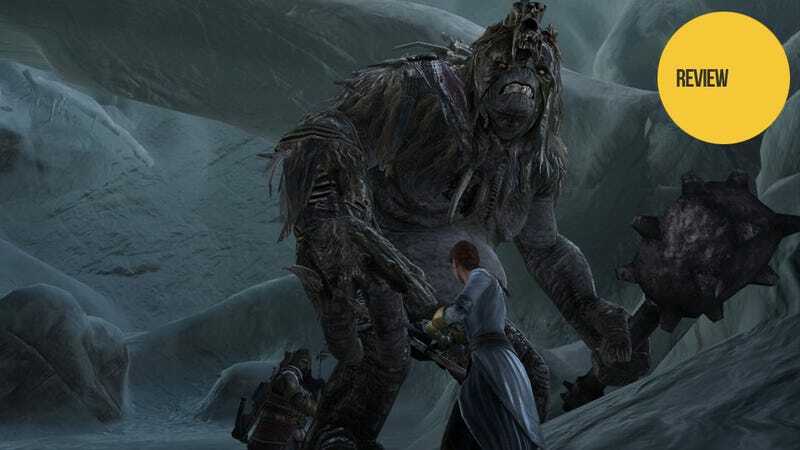 The Lord of the Rings: War in the North was released on Nov. 1 for the Playstation 3, Xbox, and PC. Warner Bros. Interactive Entertainment provided Kotaku with a copy of the game. I played through the game's campaign alone and with random folks online, and then began a new game at the higher difficulty level unlocked upon completion.